I am doing a happy dance extraordinaire in my corner of QBL: today is the release of my first 'for sale' pattern! which was made from strips cut from a 10-yard fabric bundle of Michael Miller fabrics from Craftsy which I bought back in December. Blue is my favourite colour, so the turquoises and royal blues in the bundle really attracted me. As did the price, not gonna lie. By now, you know how much I love good deals! Don't we all? In February I made the flimsy for the Craftsy Sweetens Up My Quilting Life blog hop, as I wanted to showcase the bundles available; prior to this purchase, I had had no idea you could get yardage, and fantastic deals on said yardage. I finished it in April. It is the first quilt for sale in my Etsy shop. Then I made Sunny Days. I wanted to add a row to have a rectangular quilt, and I knew I could eliminate some of the seams. I love saving thread, fabric and time as much as I love deals, LOL. I also loved the pink and yellow combination in another Michael Miller bundle from Craftsy, this one a fat quarter bundle, from which I made a second rendition of their Three Quarter Patch Tote. Sunny Days is also for sale in my Etsy shop. I was blown away the weekend that I posted the Sunny Days finish: Tish of Tish's Adventures in Wonderland, was dead serious when she sent me a message saying that her husband, David, wanted to make my pattern. I had, at first, thought she was joking. Nope. She had shown him a photo of the quilts and he really liked the design. Thought he could maybe make it. And wow, did he!! David's "Hawaiian Stepping Stones" in a tree just for me! You can read about David's first quilt, his FIRST QUILT, right here. There is no stopping this man; before he had even got to the flimsy stage, he was planning another quilt, thinking in colours on the way to work...Tish and I are just so proud of what he has done, our little, er large, manly protégé quilt-builder! I am pleased that my pattern is beginner-friendly! I am just so very thankful and grateful and truly amazed at all the help Tish has given me this past month. She it is who did the block and layout diagrams in EQ7 for me from my drawings. She even redid the layout for the background cutting in Sunny Days, not once but oh three times!!! Never one "Nope, can't do it right now, sorry," always a "Let me know if there is anything else you need." Hugs big ones, and a 'mwah!' to you my darling friend. This week I asked Cheryl of Meadow Mist Designs if she'd be able to give the pattern the once-over with her expert eye. I am so very very grateful for all the improvements that resulted from her wise suggestions! It means so much that a designer at her level would do this for little ol' me and do it pronto! Thank you Cheryl! Well I must say June 2 has been one Red Letter Day, the day that I made the final tweaks to my pattern, ready for release, and then... received an email in the later afternoon telling me that they, the Henry Glass Fabrics peeps, had chosen me, moi! to be the designer for the month of June!! I am hap-hap-hap-HAPPY DANCING indeedy-do I AM!!! When I saw the lake-themed fabric, I was like, PUH-LEEZE pick me, pick me, pick me...I live on Lake Erie; I see her every day....and well, they did pick me! I hope to make them proud. Want to throw your hat into the ring for a challenge? Follow their blog and watch for the announcement for the July challenge, usually on the blog the 1st of the month. Here is their announcement Friday morning about moi. And now to celebrate the pattern release, I am going to give away 3 (my favourite number) prizes: 2 copies of the pattern, and a 13-strip set of 2.5" fabrics that I used in Blue Skies. Sadly, due to the cost of postage, I will only be able to mail the strips within Canada and the US, but the pattern giveaway is open internationally. Just leave me a comment that says in what colour or colour combination you'd make my quilt! Followers can have a second entry, just tell me how you follow me. New followers are always welcome! **Please check if you are a no-reply blogger (Look below the comments! There's a great, simple fix right there.) and leave your email address in your comment so I can find you. If you don't, I will have to draw another winner. Helping him pattern test your pattern was so much fun! Thank you for letting us play along with you. He really had a great time and the pattern is super beginner friendly. And a HUGE CONGRATS to you for being the designer of the month for Henry Glass Fabrics! I'm hopping over to read their post now. I love you, my friend and look forward to working with you in the future. I read the progress reports as Dave made HIS quilt, and after smiling so much, looked in admiration. Greens for mine, I would love that pattern. I hopped to you from Jenny at Romany Quilting, we live about an hour apart, and gave her a surprise visit on Thursday. Yes, I am a follower now, you are on my list sidebar, on my blog, All Points of The Compass. Great pattern- I would make it in my favourite colour which is blue. Congratulations! It's a beautiful pattern. I love that it triggered the love of quilting in someone! I am loving aqua and purple together right now and think it would be amazing in this pattern. What a week for you - congratulations on both fronts! Isn't the quilting community a wonderful thing? I love the way you have quilted your quilts. Congratulations! You have come so far and your enthusiasm is contagious for all of us who follow you. 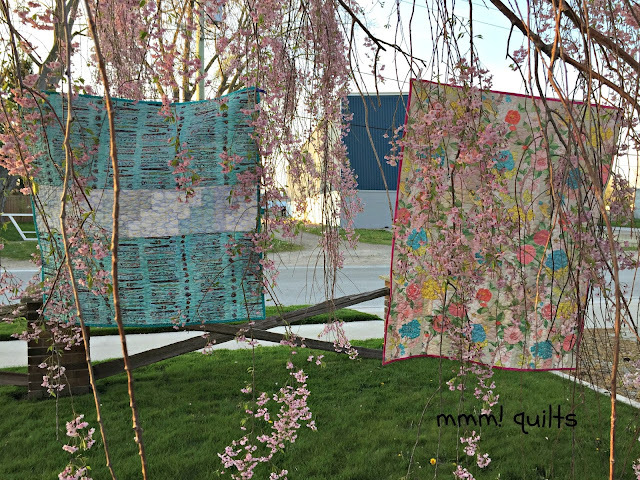 I can envision your quilt in a teal and coral combination or in hot pink and bold orange! Have a good rest of your day. Your quilts are lovely. I would like to make the pattern in aquas/turquoises, I think. Congratulations, that's great news, and well deserved. I love blues and greens, yet I have never yet used that combination. Time I did. Wow Sandra this is all such awesome news. Isn't it wonderful that Tish helped you out with EQ7 and that Cheryl read over the pattern...and i love that Tish's husband was the pattern tester. I don't know what colour i would use...maybe purple and green , not sure why that popped into my head maybe just the view of purple flowers contrasted with green leaves and grass in my backyard right now. Pretty much everything I make is blue but I really like that pink and yellow combo you've got going on there. Congrats on getting designer of the month to yippee! I follow on bloglovin my friend. That feathering is so effective in the white. Just beautiful! All the quilt colors looked great in the pattern. But I love blues. Beautiful quilts...I am really enjoying yellow and blue these days. Thanks for sharing the giveaway! Congratulations on your pattern release!! 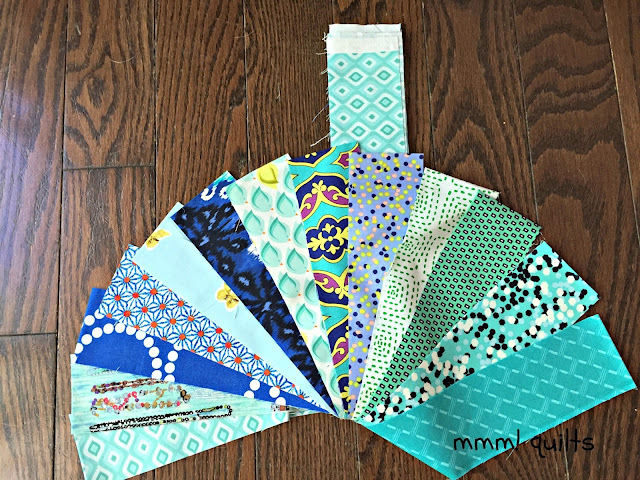 I love all shades of blue and turquoise so that is the color I would use in your pattern. Congrats on the Desire to Inspire challenge, I had the privilege of participating in April. Have fun with it. Hello. I would make the pattern in oranges and pinks, with just a touch of yellow, for a little girl who loves Dora the Explorer! Abh10066(at)aol.com. Thank you. I like blue. Love your quilted feathers. Congratulations on all your successes of late. You have been one busy girl. I would do purples and golds. I follow you through email notifications. Congratulations! And thanks for the giveaway chance. 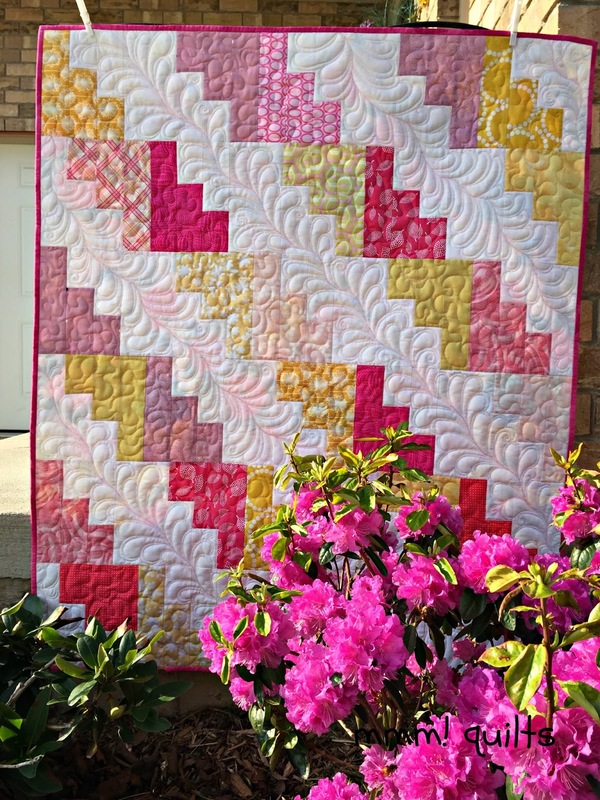 I've been wanting to do a pink and yellow quilt - this would be a good pattern. refusestofear at yahoo dot com. I love you patterns, thanks for the giveaway and I would use greens. Thanks again and I follow you through bloglovin. This is my first visit here. Congratulations on being Henry Glass' choice! I would make your pattern in red, white and blue, beautiful! I signed up to follow you by email. Wow Sandra, I am so impressed you picked my birthday to release your pattern and share your big news, LOL Since Aqua is my favorite color, that is what I would do first! But I see it in so many colorways. You already know I love that pattern and the marvelous quilting you did on it. David's test drive of your pattern is really cool, too. He should be proud. Congratulations! This is a big day for you. I suspect the Henry Glass choice will bring you a lot of new readers and deservedly so. Blue of all shades and tones!! I follow via Bloglovin- thanks!! Congratulations on your Henry Glass Designer feature - that is super exciting Sandra and I know you'll do something wonderful! Tish and Cheryl are really the best and a quilter couldn't hope for nicer, more caring friends! I'm really thrilled with David's quilt and I bought your pattern toot sweet! Your blues win me over, but more often than not I choose colors based on the recipient. I follow you in every way - just short of stalking, LOL. i am crazy for all things blue, from lightes to darkest, to almost greenish. love your quilts. I love this pattern, haven't bought it yet, but I'm going to have to! I'm not sure what colors I would make it in because each new version I see I love more! Love the red color combination, and the quilt!! I follow on facebook and bloglovin'. Beautiful quilts. Right now I have purples, dark pinks and greens waiting for inspiration. I think your pattern would work out great. I follow you (faithfully and eagerly) via email. I really like that pop of bright blue! Thank you for a chance to win. I would go with a mid mod turquoise and orange. I love the quilt so much. Congratulations on your new adventures! Started following you on bloglovin and facebook. Love your pattern as I am a newbie to quilting looks and looks like a really fun pattern to peice. I am a lover of purples and would love to do it in different shades and tones of that color. Congrats on your first pattern release. I can hardly wait to see what you come up with for Henry Glass Fabrics. So much news Sandra! Your pattern is lovely and so are the quilts your be made with it. Henry Glass?? Wow, that is so exciting. I look forward to seeing what you come up with this month. Colors? Well, my fave is any shade of green and I might use some gray with it. What colours - I think your design would look great in some New Zealand prints which I still have in abundance, and would make a lovely "give-away" quilt. I'm one of your overseas readers, so would only qualify for the pattern give-away. I would use yellow (my favorite) and purple. 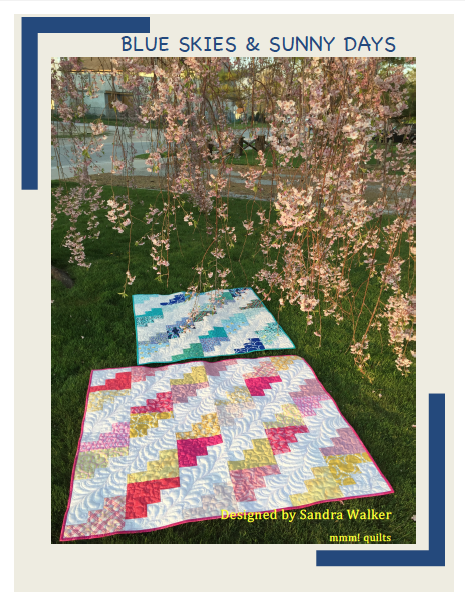 Congratulations on the pattern release, Sandra! I wish you many sales :) I love David's version of the quilt too. I'd probably have to make it in blues (since that's my favourite colour too!) or go all scrappy and colourful with a neutral background. I think that would be fun too. Thanks for the chance to win, and for linking to TGIFF this week! Of course, I am a Bloglovin' follower of yours! I'm probably too late for the giveaway but I did want to say that if I had trees as pretty as yours, I'd hang my quilts in them too!! Love both of them! your quilts are lovely. congratulations. I would make mine in white and blues. Lovely pattern. and the quilting is awesome. Congratulations! I am looking forward to see what you will do for the challenge! Beautiful pattern, congrats on your first release! Such a clean simple design. It will showcase any pretty fabric choices. Wow, Sandra! Congrats on so many things--your pattern release, your manly pattern tester, your recognition by Henry Glass! 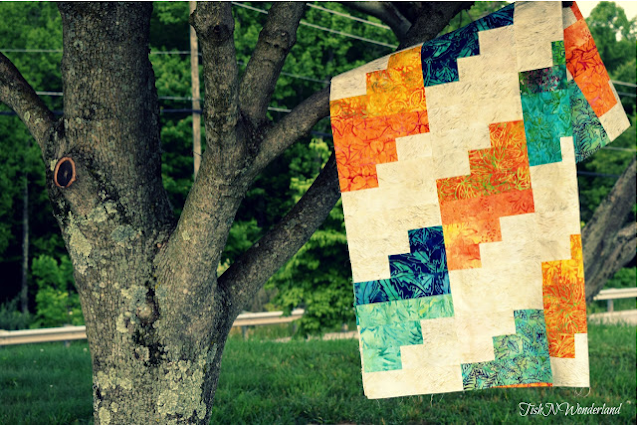 And your quilts in trees! So lovely. 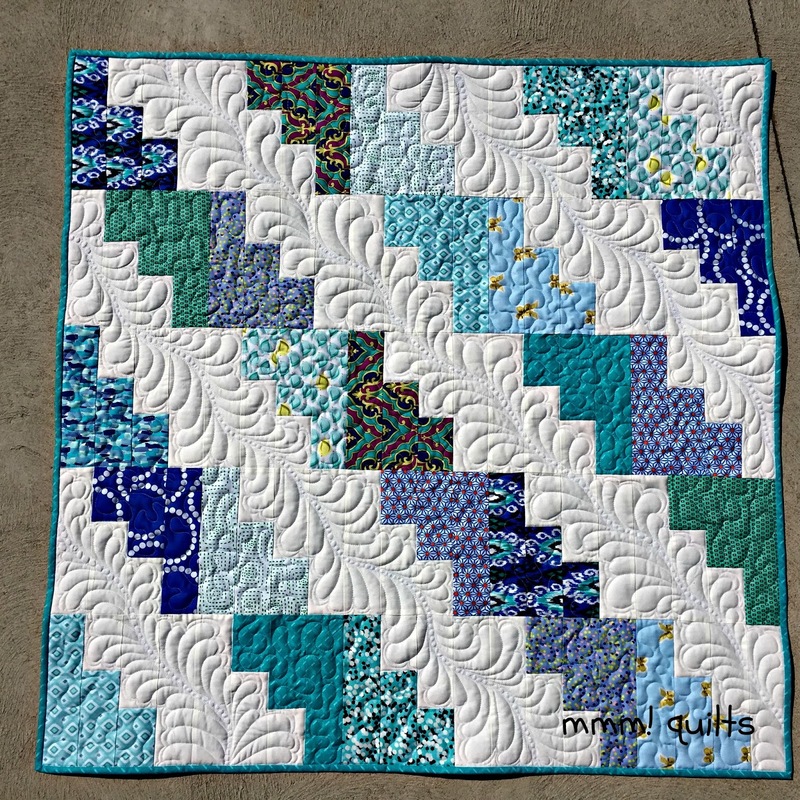 I really like your pattern, but what I love the most about the quilts is the extensive feather quilting and how it just jumps off the quilts. I've been away from blogland a lot in the last week, so I missed your giveaway. No matter. It was a treat just to read your post. Congratulations on your pattern (I will buy one) and on being selected as desinger of the month. Both are very exciting. Wonderful quilt pattern! So easy to imagine it in different colorways. If you ever need a pattern tester in the future, send me an email. Maybe we could work out an exchange of pattern testing! Love your work. Congratulations on the release of your pattern! Such lovely colors and the quilting is spectacular :*) I'm too late for the giveaway, but may be checking out the pattern shortly. 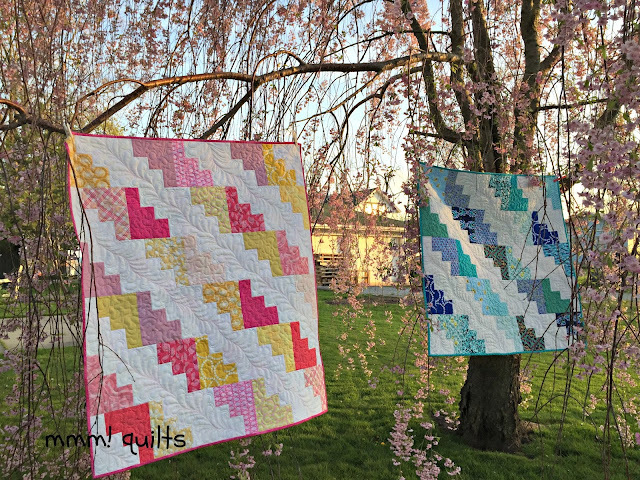 Beautiful pattern and love the fabrics used in the quilts! Visiting from BuzzinBumble. Beautiful. I love the feathers that are quilted in the rows. How exciting to have quilts and a pattern for sale AND being chosen by Henry Glass, congratulations!! No wonder though, the quilts are lovely! Thank you for sharing all of your beautiful quilts. Quite inspiring! Love your blue skies quilt. Great suggestion to buy a 10 yard bundle of fabric.